Oooh Christmas is getting nearer! I don’t know about you but I’m humming silly festive tunes, wrapping gifts and gravitating to foods with ginger or cranberry in them. As you know I’m sewing up various items from Simplicity 1516. First it was the Christmas ornaments… now a lovely Christmas stocking. In case you’ve forgotten, this pattern includes templates for the following festive felt decorations: a tree skirt with happy characters, a stocking with pocket, and hanging ornament animals including a squirrel, bear, fox, snowman, moose and owl. There’s also the suggestion to turn the animals into wall hangings. You might say, why do I need a pattern for a stocking? Well doesn’t it just take all of the hassle out of the measuring and thinking out the instructions? 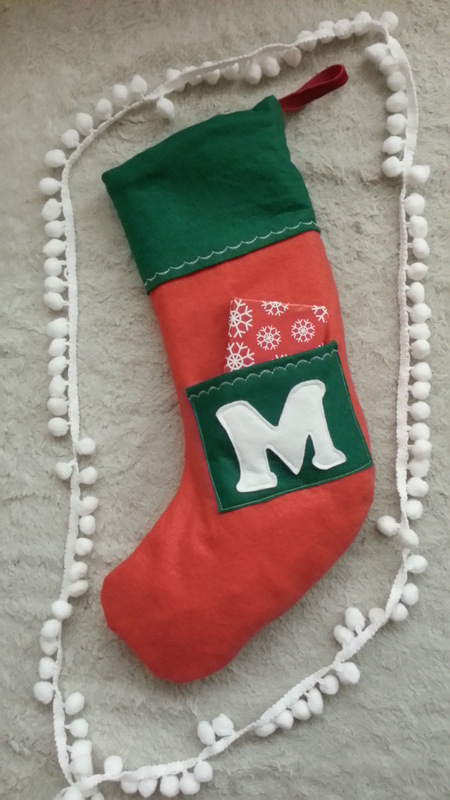 My stocking is made from red and green felt. I love the pocket and cuff; I feel like they add a simple charm to the finished item. For me, the template creates a good size stocking that I have filled with three medium gifts (one in the little pocket). I also added white scallop topstitching which is one of the few decorative stitches my machine has. There is a velvet ribbon hanging loop that is caught in the cuff seam securely. And finally I personalised my stocking for its recipient by adding a monogram; as this will hold the gifts I’ve got for my Brother’s girlfriend. I think this is super cute and only took me 20 mins to make. And actually, I stopped to make a cup of hot Ribena in the middle of construction so probably less than that! The instructions are clear and consise and produce a neat finish on the cuff and pocket. If I have time, I might rustle up a few more. What do you think? Are you making a stocking this year? Now I’m off to quietly hum “All I Want For Christmas” and hope my fella doesn’t hear me. That’s the Christmas song he hates the most! Is the stocking felt? Looks cool. I still hang up the stocking I made five years ago. It has the worst sewing in the world (hand sewn) and is held together mainly with sellotape! I know that I could re- do it now I’ve learnt to sew but there is something about it that makes me smile when I get it out of the decorations box. Perhaps I will treat my other half to a nice stocking instead. Aww how nice that you kept it together all these years! Yep this one is felt. I’m hoping it’ll last M quite a while. I really want this pattern! Great stocking.